According to a new technology adoption study, farmers say Precision.AgWired.com. More than eight out of ten soybean, corn, wheat and cotton growers who use precision technology on their farming operation say that this factor has increased their profitability, according to preliminary research findings from an effort conducted by dmrkynetec (formerly Doane Marketing Research, Inc.) in partnership with the newly inaugurated PrecisionAg Institute. The study also found that the mean savings per acre across different cropping systems including corn, soybeans, wheat and cotton, ranged from $5.29 per acre to $9.44 per acre – and the more precision technology a grower used, the greater profitability they reported. These are preliminary results of the research study, which was compiled from hundreds of grower interviews during the past three months and is designed to create a comprehensive benchmark of precision technology adoption among row crop growers in the United States. The research is now entering its final phase, which will feature focus groups designed to ground-truth key findings, as well as unearth more of the psychological barriers to precision adoption. The final results of the research will be released at the InfoAg Conference, July 10-12, 2007, at the Crowne Plaza Hotel in Springfield, IL. More information about the PrecisionAg Institute can be found at www.precisionag.com. AgriTalk was live here in Tampa, Florida on the first official day of the Commodity Classic interviewing a number of representatives. 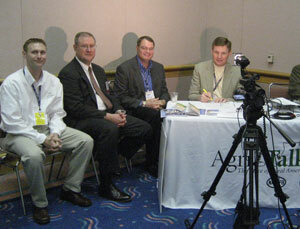 Pictured here with AgriTalk host Mike Adams (right) from left to right are Kyle Collins, John Deere Ag Management Solutions; Bob Callanan, American Soybean Association; and Barry Nelson with John Deere. AgriTalk’s opening segment from Classic featured Barry and Bob announcing the winners of the “Reach for the Stars” contest; followed by Kyle talking about John Deere’s Swath Control Pro, which was introduced one year ago at last year’s Commodity Classic. Fifteen lucky soybean growers from around the country will soon receive a premium-level precision ag system worth more than $20,000 to use on their operation for the 2007 growing season as the winners of the “Reach For The Stars” contest, a joint effort of the American Soybean Association and John Deere Ag Management Solutions (AMS). More than 400 growers registered for the contest and winners were selected through an independent process of grower experience and geographic diversity. 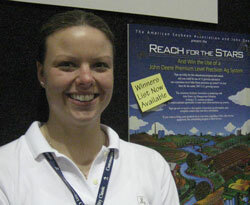 The winners were announced today at the 2007 Commodity Classic in Tampa, Florida. The contest prize package includes use of a GreenStarTM AutoTracTM Assisted Steering System with an AutoTrac Universal Steering Kit, a StarFireTM iTC receiver, and a John Deere SF2 signal activation; a GreenStarTM 2 System, which includes a GreenStar Display 2600 and preloaded GreenStar Basics software; and GreenStar Apex Farm Management Software. After the program ends, qualified participants will be offered an opportunity to purchase the entire system, or just the components they want to own, at a greatly reduced price. The John Deere booth is getting set up at the 2007 Commodity Classic, preparing for thousands of growers from around the country to visit. The booth features all of the very latest John Deere precision equipment and plenty of company officials on hand to meet with growers and let them know how they can make their jobs faster, easier and more efficient. Stay tuned for more from the show! If you have any questions or need further information about John Deere products, please contact Barry Nelson at 913-310-8324 or NelsonBarryE@JohnDeere.com. In addition to posting regular information on precision agriculture here John Deere is also sponsoring a regular audio program called the Precision Ag Minute. Besides airing on radio stations we’ll be posting the program for you to listen to here as well. The program is being produced by Peter Shinn at Brownfield. If you’re interested in an online calculator that can be used to calculate your return on investment in an AutoTrac Guidance System then you can find one right here. PrecisonPays.com is a website specifically designed to bring you the latest information and resources on guidance and other precision technology for agriculture. We’ll be bringing you new and updated information several times a week so make sure you bookmark this website or subscribe to our RSS feed. 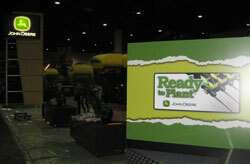 To jump start us, this week we’ll be featuring posts from the Commodity Classic in Tampa, FL where we’ll see that latest being offered by John Deere, the sponsor of precision.agwired.com. You’ll find pictures and interviews to listen to and we hope you enjoy what you see and hear. Please feel free to use the comment feature to submit your comments. We’re excited to bring you the latest in agricultural precision technology using the latest in communications tools. At Commodity Classic this week John Deere will be hosting a What Is New (WIN) session on Friday from 1:00-4:00pm. It’s during this session that the winners of the Reach For the Stars program will be announced. During the session John Deere will cover their full line of precision guidance products and software. 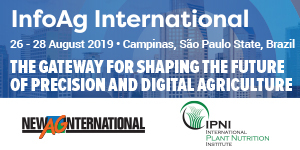 Total tractor automation is now possible with the new precision guidance system, iTEC Pro, and product experts will be available to explain the details of this new technology. We’ll be there to conduct interviews and post information right here for you to read and listen to. This is an especially timely post with Commodity Classic coming up this week in Tampa, FL. In fact, I’ll be there to bring you all the latest from John Deere at this annual event which is the simultaneous annual meetings of the National Corn Growers Association, the American Soybean Association and the National Association of Wheat Growers.